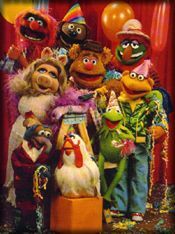 Multiple sources from Time-Life Video have confirmed that next month more Muppet Show volumes will be arriving on DVD for the first time in celebration of The Muppet Show's 25th anniversary. Time-Life will be releasing volumes 11-15 on DVD by the end of September with plans to have the new volumes available for purchase on-line immediately following. "The Best of the Muppet Show" volumes 11-15 were originally released in March 2001, but only on VHS. What makes this a surprising move is the recent announcement that Columbia would be releasing nearly identical versions of the same "Best of the Muppet Show" DVD's and videos in stores beginning September 3rd. Even though Columbia plans on eventually releasing 20 volumes (Time-Life currently has 15), fans might want to get the Time-Life DVD's since there is no guarantee that the Columbia deal will be fulfilled if sales drop-off with the earlier volumes. Columbia cannot release any of the Time-Life volumes in stores for at least a year after their release. So the soonest Columbia could release volumes 11-15 would be September 2003.